Hanoi (VNA) – Ambassador Nguyen Phuong Nga, Permanent Representative of Vietnam to the United Nations, has affirmed the country’s commitment to work closely with the UN Development Programme (UNDP) to realise the Sustainable Development Goals (SDGs). “Vietnam is strongly committed to work closely with UNDP and other UN agencies to make the SDGs a reality, to build a more prosperous, fair and inclusive world for all,” Nga said at the UNDP 50th Anniversary Ministerial Meeting in New York on February 24. Ambassador Nga on behalf of the Government and people of Vietnam thanked the UN agency for its precious support and cooperation to Vietnam. 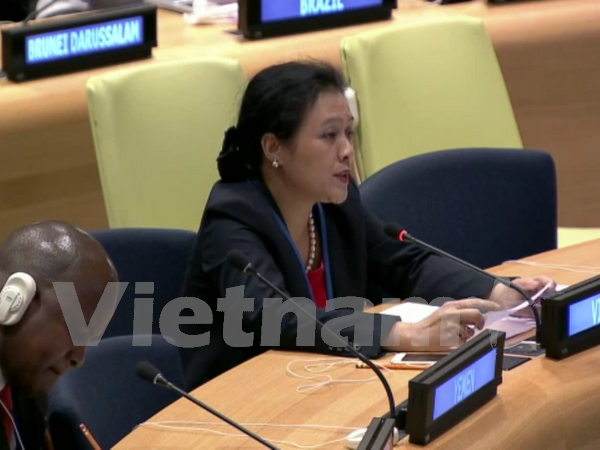 UNDP was among the first to come to help Vietnam to rebuild the country after many decades of wars, she said. With the assistance of UNDP together with other UN agencies and development partners, Vietnam has made great strides in reconstruction, poverty reduction, implementation of the Millennium Development Goals (MDGs) and now moved on the new path of inclusive and sustainable development. UNDP also plays an important role as the lead agency in successfully implementing Delivering As One (DAO) in Vietnam, making UN assistance more focused, strategic, coherent, efficient and effective, she added.